How you doin’? I’m doin’ swale. For the past few years, I have been reading a variety of books about natural ways of farming with an emphasis on environmental regeneration, perennial food systems, and permaculture. For those who may not be familiar with permaculture, it is a phrase coined in part by Bill Mollison of Australia. It comes from the words “permanent agriculture”. Permaculture really covers a lot more than food production. It is a way of thinking about and designing systems that maximize output and benefits while minimizing problems and inputs. The study covers everything from vegetable gardens and animal husbandry to social and political organization. Truly A to Z in how we as humans can meet our needs in truly sustainable fashions. Not the buzzword “sustainable”, but really perpetual systems. Like forever. For realsies. A lot of things that are done today and labeled “sustainable” cannot really be done forever. A lot of what is out there on permaculture talks about things that can be done on a small, urban scale. Farm systems are a whole lot different. For example, a 55 gallon drum rain barrel might be great for watering a flower bed, but will do practically nothing to meet the needs of a ¼ acre garden let alone some 20 acres of pasture and 10 acres of forest. Two of the best books I have read recently around the subject of farm scale permaculture are the Resilient Farm and Homestead by Ben Falk and Restoration Agriculture by Mark Shepard. They both advocate for on contour or slightly off contour swales with trees planted on top of the berm. Ok so now let’s talk trees and savannahs. Some of the most productive systems in the world are savannahs. Think Africa. Big trees, spread out, animals of all kinds grazing and foraging beneath. Joel Salatin of Polyface Farm in Swoop, VA says that if he had his way, all his pastures would be savannahs. There have been a lot of studies lately on intentionally creating savannah-like conditions for grazing. It’s commonly called Silvopasture. We want to do that. 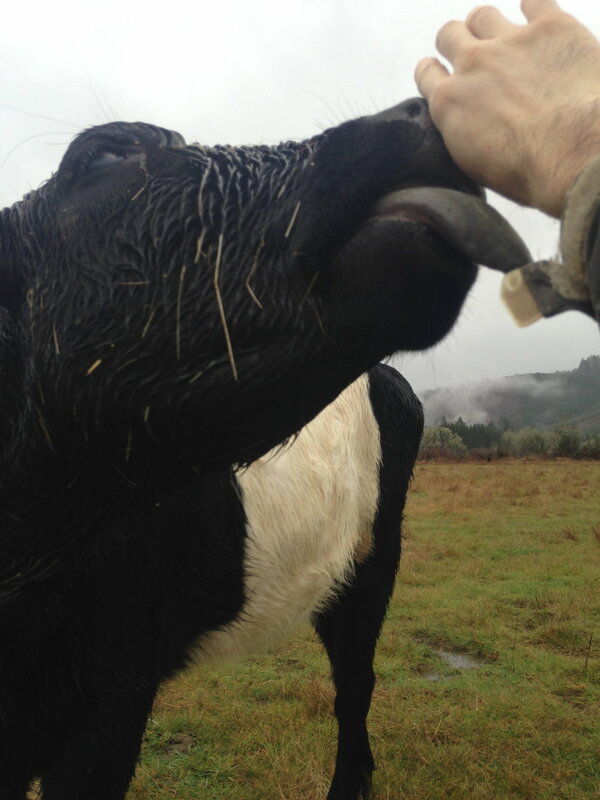 Fern, our Dutch Belted heifer and future milk cow. She loves me and she loves swales. It’s true, a lot of humans have spent countless hours removing trees from pastures. Part of that is so bigger farm equipment can be used in haymaking, tilling, or whatever else to try and gain time efficiencies. But have you ever noticed how in the middle of summer the grass under trees is often still green? Or how the grass under trees grows sooner in the spring? Since we are trying to feed animals that eat grass, you can see why this is attractive to us. So back to the swales. The berms create terrific conditions for trees to grow. There is a place for water to gather, yet the tree is not submerged. This leads to better and faster tree growth. 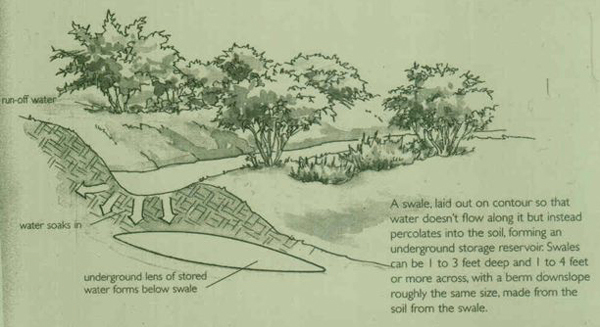 Also the grass below the swale should in theory grow better because the tree provides shelter from the wind, heat, and cold and the swale provides additional moisture. Better growing conditions, better grass, and more of it. The trees also have the ability to send their roots deep into the soil and bring up additional nutrients. These then are stored in the leaves which later fall to the ground and help feed the pasture. More minerals in the grass means more minerals for the animals and in turn more minerals for you! It’s a wonderful thing. We put in 4 swales to start with a linear total somewhere in the neighborhood of 1400 feet. We spaced them around 100 feet apart to begin with, but that distance varies as the contour of the land changes. A lot of the time when creating silvopasture systems, the farmer focuses on trees for lumber. As Mark Shepard points out, a tree that gives you lumber shades just as good as a tree that gives you nuts or fruit and many of those same trees can give you lumber too (if you so desire). So we are going to be planting hundreds, if not thousands of fruit and nut trees in the berms to provide shelter and food in addition to possibly lumber and firewood in the future. More on that another day. I don’t know about you, but when I try something I have never done, never seen in person, and only read about in books, I tend to get a little nervous. Will it actually work the way it is supposed to? Did I do it right? Well with something like swales, the answers are not immediate and if they don’t work, that is a lot of wasted time and money. It took 2 entire days on an excavator to put them in (which was a lot of fun for the first 10 hours). We have pretty good soil on the farm so when we get an inch or two of rain, most of it absorbs pretty quickly and not much makes it to the swale. As winter passed, I saw small puddles in the swales and couldn’t help but to start to wonder if we had wasted our time. Then February happened. 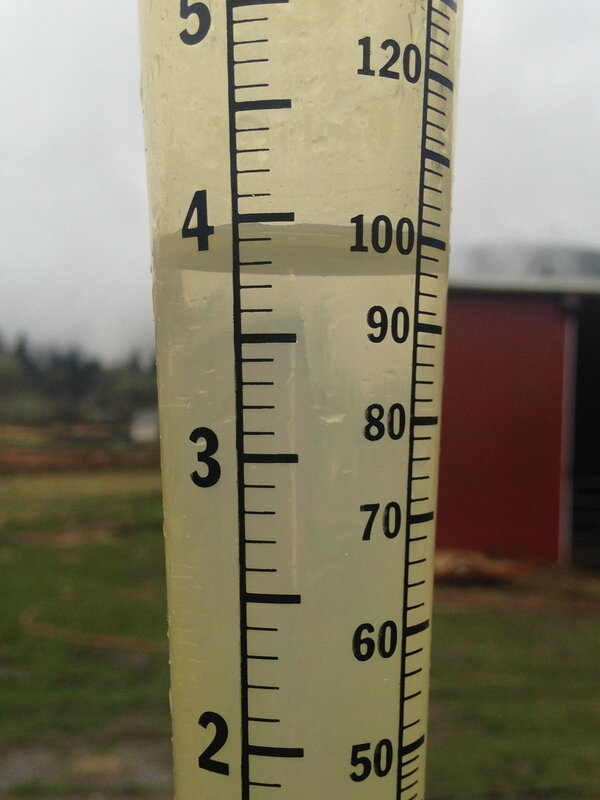 So far this month we have gotten just over 14 inches of rain. The average is around 5.5 inches. At the beginning of the month we got 4 inches overnight and 8 inches over a weekend. As I was drinking my morning coffee I looked out and saw the lower field was flooded. I threw on my boots and ran out to investigate the swales. They worked! Look at all that water! I’m not really good at estimating volume, but I’d wager to say there’s at least 5 gallons in there. That is water that would have otherwise run to the bottom of the field and off under the neighbor’s fence. Instead, it stayed put and will slowly absorb as the ground can handle it. It will also sink and help refill the aquifer below the farm. I just discovered a hole in my boot. 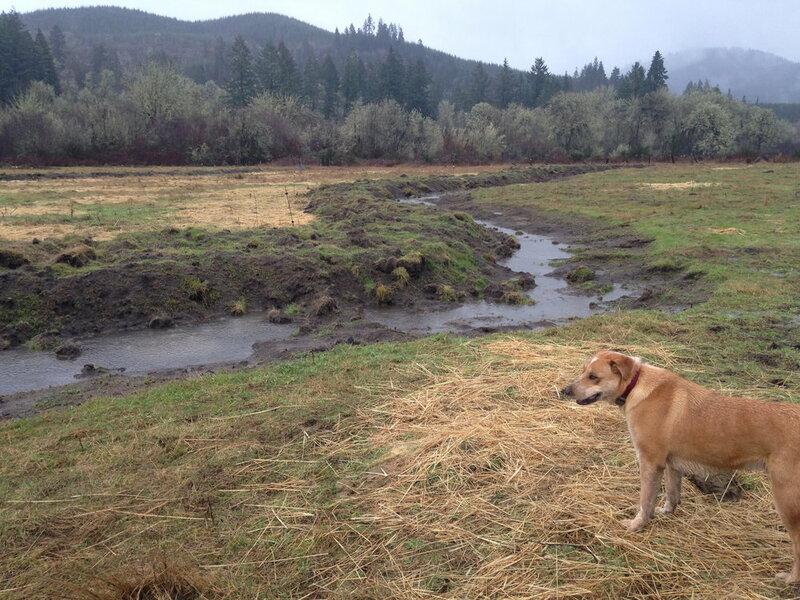 We’ll write more as we continue to work with the swales and the systems matures. For now, thanks for reading and for supporting healing agriculture.